We’re playing with the scheduling link on the left. Let us know what you think! Notes: Perform 1 Front Squat to start, then every minute add 1 more rep. Reps do not need to be unbroken but once you cannot perform the required Front Squats in that allotted minute, Run 800 meters. Only full rounds count. If you complete Round 12, you do not have to run. Notes: Perform 1 Kettlebell Swing to start, then every minute add 1 more rep. Reps do not need to be unbroken but once you cannot perform the required Kettlebell Swing in that alotted minute, Run 400 meters. Score is based off of completed rounds. If you complete round 15, you do not have to run 400 meters. Notes: Ideally the plank holds will be performed on hands with a perfect hollow body position. The scale down is to perform on your elbows. Note the tripod position in the picture above. There is a triangular relationship between the head and the hands, with the elbows facing in, that creates stability for inversion. 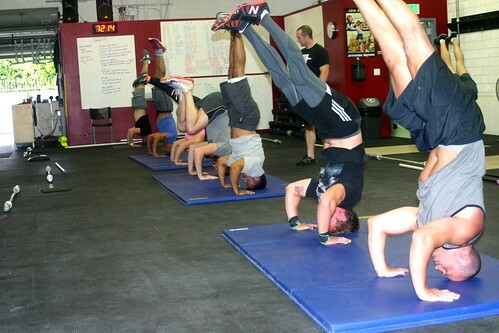 Mastering the tripod leads to better handstand presses, better overhead presses, and better push ups in general.